This article is about the alcoholic beverage. For the card game, see Gin rummy. For other uses, see Gin (disambiguation). Gin is a distilled alcoholic drink that derives its predominant flavour from juniper berries (Juniperus communis). Gin is one of the broadest categories of spirits, all of various origins, styles, and flavour profiles, that revolve around juniper as a common ingredient. From its earliest origins in the Middle Ages, the drink has evolved from a herbal medicine to an object of commerce in the spirits industry. Gin was developed based on the older Dutch liquor, jenever, and became popular in Great Britain (particularly in London) when William of Orange became King William III of England. Gin today is produced in subtly different ways, from a wide range of herbal ingredients, giving rise to a number of distinct styles and brands. After juniper, gin tends to be flavoured with botanical/herbal, spice, floral or fruit-flavours or often a combination. It is most commonly consumed mixed with tonic water. Gin is also often used as a base spirit to produce flavoured gin-based liqueurs such as, for example, Sloe gin, traditionally by the addition of fruit, flavourings and sugar. The physician Franciscus Sylvius has been falsely credited with the invention of gin in the mid-17th century, although the existence of genever is confirmed in Philip Massinger's play The Duke of Milan (1623), when Sylvius would have been about nine years old. It is further claimed that English soldiers who provided support in Antwerp against the Spanish in 1585, during the Eighty Years' War, were already drinking genever for its calming effects before battle, from which the term Dutch courage is believed to have originated. According to some unconfirmed accounts Gin originated in Italy. By the mid-17th century, numerous small Dutch and Flemish distillers had popularized the re-distillation of malt spirit or malt wine with juniper, anise, caraway, coriander, etc., which were sold in pharmacies and used to treat such medical problems as kidney ailments, lumbago, stomach ailments, gallstones, and gout. Gin emerged in England in varying forms by the early 17th century, and at the time of the Restoration, enjoyed a brief resurgence. Gin became vastly more popular as an alternative to brandy, when William III, II & I and Mary II became co-sovereigns of England, Scotland and Ireland after leading the Glorious Revolution. Particularly in crude, inferior forms, where it was more likely to be flavoured with turpentine. Gin drinking in England rose significantly after the government allowed unlicensed gin production, and at the same time imposed a heavy duty on all imported spirits such as French brandy. This created a larger market for poor-quality barley that was unfit for brewing beer, and in 1695–1735 thousands of gin-shops sprang up throughout England, a period known as the Gin Craze.. Because of the low price of gin, when compared with other drinks available at the same time, and in the same geographic location, gin began to be consumed regularly by the poor. Of the 15,000 drinking establishments in London, not including coffee shops and drinking chocolate shops, over half were gin shops. Beer maintained a healthy reputation as it was often safer to drink the brewed ale than unclean plain water. Gin, though, was blamed for various social problems, and it may have been a factor in the higher death rates which stabilized London's previously growing population. 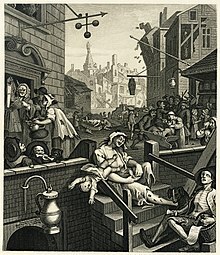 The reputation of the two drinks was illustrated by William Hogarth in his engravings Beer Street and Gin Lane (1751), described by the BBC as "arguably the most potent anti-drug poster ever conceived." The negative reputation of gin survives today in the English language, in terms like gin mills or the American phrase gin joints to describe disreputable bars, or gin-soaked to refer to drunks. The epithet mother's ruin is a common British name for gin, the origin of which is the subject of ongoing debate. In London in the early 18th century, much gin was distilled legally in residential houses (there were estimated to be 1,500 residential stills in 1726) and was often flavoured with turpentine to generate resinous woody notes in addition to the juniper. As late as 1913, Webster's Dictionary states without further comment, "'common gin' is usually flavoured with turpentine". Dutch or Belgian gin, also known as jenever or genever, evolved from malt wine spirits, and is a distinctly different drink from later styles of gin. Schiedam, a city in the province of South Holland, is famous for its jenever-producing history. The same for Hasselt in the Belgian province of Limburg. The oude (old) style of jenever remained very popular throughout the 19th century, where it was referred to as Holland or Geneva gin in popular, American, pre-Prohibition bartender guides. The 18th century gave rise to a style of gin referred to as Old Tom gin, which is a softer, sweeter style of gin, often containing sugar. Old Tom gin faded in popularity by the early 20th century. Sloe gin is traditionally described as a liqueur made by infusing sloes (the fruit of the blackthorn) in gin, although modern versions are almost always compounded from neutral spirits and flavourings. Similar infusions are possible with other fruits, such as damsons. Another popular gin-based liqueur with a longstanding history is Pimm's No.1 Cup (25% alcohol by volume(ABV), which is a fruit cup flavoured with citrus and spices. Since 2013 gin has been in a period of ascendancy worldwide, with many new brands and producers entering the category leading to a period of strong growth, innovation and change. More recently gin-based liqueurs have been popularised, reaching a market outside that of traditional gin drinkers, including fruit-flavoured and usually coloured 'Pink gin', Rhubarb gin, Spiced gin, Violet gin, Blood orange gin and Sloe gin. Surging popularity and unchecked competition has led to consumer's conflation of gin with gin liqueurs and many products are straddling, pushing or breaking the boundaries of established definitions in a period of genesis for the industry. Although many different styles of gin have evolved, it is legally differentiated into four categories in the European Union, as follows. This includes the earliest class of gin, which is produced by pot distilling a fermented grain mash to moderate strength e.g. 68% ABV, and then redistilling it with botanicals to extract the aromatic compounds. It must be bottled at a minimum of 30% ABV. Juniper-flavoured spirit drinks may also be sold under the names Wacholder or Ginebra. This is a juniper-flavoured spirit made not via the redistillation of botanicals, but by simply adding approved natural flavouring substances to a neutral spirit of agricultural origin. The predominant flavour must be juniper. Minimum bottled strength is 37.5% ABV. Distilled gin is produced exclusively by redistilling ethanol of agricultural origin with an initial strength of 96% ABV (the azeotrope of water and ethanol) in stills traditionally used for gin, in the presence of juniper berries and of other natural botanicals, provided that the juniper taste is predominant. Gin obtained simply by adding essences or flavourings to ethanol of agricultural origin is not distilled gin. Minimum bottled strength is 37.5% ABV. London gin is obtained exclusively from ethanol of agricultural origin with a maximum methanol content of 5 grams per hectolitre of 100% ABV equivalent, whose flavour is introduced exclusively through the re-distillation in traditional stills of ethanol in the presence of all the natural plant materials used, the resultant distillate of which is at least 70% ABV. London gin may not contain added sweetening exceeding 0.1 grams of sugars per litre of the final product, nor colourants, nor any added ingredients other than water. The predominant flavour must be juniper. The term London gin may be supplemented by the term dry. Minimum bottled strength is 37.5% ABV. In the United States, gin is defined as an alcoholic beverage of no less than 40% ABV (80 proof) that possesses the characteristic flavour of juniper berries. Gin produced only through distillation or redistillation of aromatics with an alcoholic wash can be further distinguished and marketed as "distilled gin". 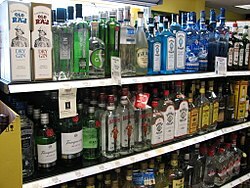 The Canadian Food and Drug Regulation recognises gin with three different definitions (Genever, Gin, London or Dry gin) that loosely approximate the US definitions. Whereas a more detailed regulation is provided for Holland gin or genever, no distinction is made between compounded gin and distilled gin. Either compounded or distilled gin can be labelled as Dry Gin or London Dry Gin if it does not contain any sweetening agents. Some legal classifications (protected denomination of origin) define gin as only originating from specific geographical areas without any further restrictions (e.g. Plymouth gin (PGI now lapsed), Ostfriesischer Korngenever, Slovenská borovička, Kraški Brinjevec, etc. ), while other common descriptors refer to classic styles that are culturally recognised, but not legally defined (e.g. Old Tom gin). Sloe gin is also worth mentioning as although technically a gin-based liqueur it is unique in that the EU spirit drink regulations stipulate the colloquial term sloe gin can legally be used without the 'liqueur' suffix when certain production criteria are met. Pot distilled gin represents the earliest style of gin, and is traditionally produced by pot distilling a fermented grain mash (malt wine) from barley or other grains, then redistilling it with flavouring botanicals to extract the aromatic compounds. The fermentation of grain mash produces a neutral alcohol (similar to vodka) that is predominately tasteless except for the iconic ethyl alcohol taste. A double gin can be produced by redistilling the first gin again with more botanicals. Due to the use of pot stills, the alcohol content of the distillate is relatively low; around 68% ABV for a single distilled gin or 76% ABV for a double gin. This type of gin is often aged in tanks or wooden casks, and retains a heavier, malty flavour that gives it a marked resemblance to whisky. Korenwijn (grain wine) and the oude (old) style of Geneva gin or Holland gin represent the most prominent gins of this class. Column distilled gin evolved following the invention of the Coffey still, and is produced by first distilling high proof (e.g. 96% ABV) neutral spirits from a fermented mash or wash using a refluxing still such as a column still. The fermentable base for this spirit may be derived from grain, sugar beets, grapes, potatoes, sugar cane, plain sugar, or any other material of agricultural origin. The highly concentrated spirit is then redistilled with juniper berries and other botanicals in a pot still. Most often, the botanicals are suspended in a "gin basket" positioned within the head of the still, which allows the hot alcoholic vapours to extract flavouring components from the botanical charge. This method yields a gin lighter in flavour than the older pot still method, and results in either a distilled gin or London dry gin, depending largely upon how the spirit is finished. Compound gin is made by simply flavouring neutral spirits with essences or other "natural flavourings" without redistillation, and is not as highly regarded as distilled gin. Popular botanicals or flavouring agents for gin, besides the required juniper, often include citrus elements, such as lemon and bitter orange peel, as well as a combination of other spices, which may include any of anise, angelica root and seed, orris root, licorice root, cinnamon, almond, cubeb, savory, lime peel, grapefruit peel, dragon eye (longan), saffron, baobab, frankincense, coriander, grains of paradise, nutmeg, cassia bark or others. The different combinations and concentrations of these botanicals in the distillation process cause the variations in taste among gin products. Chemical research has begun to identify the various chemicals that are extracted in the distillation process and contribute to gin's flavouring. For example, juniper monoterpenes come from juniper berries. Citric flavours come from chemicals such as limonene and gamma-terpinene linalool. Spice-like flavours come from chemicals such as sabinene, delta-3-carene, and para-cymene. ^ Forbes, R. J. (1997). A Short History of the Art of Distillation from the Beginnings up to the Death of Cellier Blumenthal. Brill Academic Publishers. ^ a b c Brownlee, Nick (2002). "3 – History". This is alcohol. Sanctuary Publishing. pp. 84–93. ISBN 978-1-86074-422-8. ^ a b "Gin (definition)". Retrieved 6 October 2014. ^ White, Matthew. "Health, Hygiene and the Rise of 'Mother Gin' in the 18th Century". Georgian Britain. British Library. Retrieved 6 August 2017. ^ Finlo Rohrer (28 July 2014). "When gin was full of sulphuric acid and turpentine". Retrieved 28 July 2014. ^ "Origin of the phrase "mother's ruin?"". English Language and Usage. Retrieved 18 January 2016. ^ "Distil my beating heart". The Guardian. London. 1 June 2002. Retrieved 3 May 2010. ^ "Coffey still – Patent Still – Column Still: a continuous distillation". StillCooker & Friends. Retrieved 29 March 2013. ^ "Google Trends". Google Trends. Retrieved 2019-01-24. ^ Naylor, Tony (2018-12-06). "Pink gin is booming – but here's why many purists loathe it". The Guardian. ISSN 0261-3077. Retrieved 2019-01-24. ^ "Gin". Oxford Dictionaries. Oxford University Press. Retrieved 2018-10-13. ^ For etymology of genever, see "Genever". Oxford Dictionaries. Oxford University Press. Retrieved 2018-10-13. . For genièvre, see "Genièvre". Ortolang (in French). CNRTL. Retrieved 2018-10-13. . For jenever, see De Vries, Jan (1997). "Jenever". Nederlands Etymologisch Woordenboek (in Dutch). Brill. p. 286. ISBN 978-90-04-08392-9. Retrieved 2018-10-13. .
^ "Food and Drug Regulations (C.R.C., c. 870)". Justice Laws Website - Canada. Government of Canada. Retrieved 21 July 2017. ^ "Home Distillation of Alcohol (Homemade Alcohol to Drink)". Retrieved 6 October 2014. ^ Riu-Aumatell, M.; Vichi, S.; Mora-Pons, M.; López-Tamames, E.; Buxaderas, S. (2008-08-01). "Sensory Characterization of Dry Gins with Different Volatile Profiles". Journal of Food Science. 73 (6): S286–S293. doi:10.1111/j.1750-3841.2008.00820.x. ISSN 1750-3841. ^ Branch, Legislative Services. "Consolidated federal laws of canada, Food and Drug Regulations". laws.justice.gc.ca. Wikimedia Commons has media related to Gin. Look up gin in Wiktionary, the free dictionary.